30 Second Wine Advisor: Good year for GV?  Good year for GV? Here's a delicious little secret: Vintage 2006 is looking like an exceptional year for Austrian Grüner Veltliner. Crisp and fresh yet minerally and surprisingly complex, this fine '06 GV is a real value at this price point, well worth seeking out. Here's one of the most important rules about wine vintages: Don't obsess about good years, bad years, so-so years. Vintage is only a guide, and even the worst vintages generally produce a few happy surprises (and vice versa). A slavish reliance on buying only "good years" can just make you crazy ... and maybe cause you to miss some excellent drinking. On the other hand - and there's almost always another hand when it comes to the rules of wine - vintage can be a useful rule of thumb. When you're making a quick decision at the wine store or on a restaurant wine list, it's not a bad thing to be able to narrow your choice by focusing on the years that provide plenty of low-hanging fruit. Some prime vintages are widely discussed and easy to remember (or look up in handy reference books like the annually updated Hugh Johnson's Pocket Wine Book). Most of the Burgundy fanciers I know agree that 2005 is a no-brainer for Burgundy and much of France, for instance; in Northwestern Italy, the Piemontese are already talking excitedly about the still youthful 2004s, and I haven't heard many California wine enthusiasts trash-talking the 2001 Napa Cabernets. News doesn't travel so fast about some of the more obscure regions, though, so it took me a while to put two and two together about a delicious little secret: Vintage 2006 is looking like an exceptional year for Austrian Grüner Veltliner. The Austria Wine Marketing Board had begun trumpeting the vintage within days after the grapes were picked, declaring it "A Great Vintage" on the trade association's Website, WinesFromAustria.com, in November 2006. "Everything from immense satisfaction to traces of euphoria is being expressed throughout all of Austria's wine growing areas," the board exulted in a news release. "In every Austrian wine region, there are references to the high sugar levels, which - unlike vintages such as 2000 or 2003 – are balanced by equally generous acidity. And with this, optimal development potential and longevity can be confidently predicted for the wines." Of course, wine marketers almost invariably talk like that. Still, the more objective Hugh Johnson seemed to agree, in his glowing reference to Austria '06 in the latest Pocket Wine Book: "An exceptional year ... one of the hottest late summers on record. Grape qualities everywhere [in Austria] were very good, but yields were small." Commenting on wines of value in Monday's WineLoversPage.com Internet wine radio TalkShoe, our resident German and Austrian wine guru David Bueker agreed, praising the overall quantity of the vintage. Looking back over my own recent tastings, I find that I have yet to encounter a 2006 "GV" that I didn't like, and have found them consistently sharp, focused and loaded with that subtle Grüner minerality. What's more, with the exception of a few highly rated single-vineyard bottlings that can be mighty spendy, GV in general remains one of the more attractive categories for wines of excellent quality-price ratio. We enjoyed an exceptionally good one for a rational price on New Year's Eve. 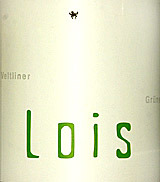 The "Lois" GV from Loimer in Kamptal is the winery's low-end label, and frankly, it has come across as correct but unexceptional in some past vintages. The 2006, though, was a delight, crisp and fresh yet minerally and surprisingly complex. Its minimalist label stands out on the shelf, bearing only the word "Lois" in green and "Grüner Veltliner" in pale, almost invisible gray; a tiny, indecipherable logo, in a Rorshach kind of way, seems to resemble a tiny, crouching man jumping up and down. Only the back label reveals that it's a 2006, from Austria's Kamptal region, and - in the tiniest possible type, smaller even than the U.S. Surgeon General's warning, the information that it's produced and bottled by Fred Loimer. A real value at $10 to the lower teens, it's well worth seeking out. My tasting notes are below. FOOD MATCH: A natural with a dish crafted to match, the fresh vegetable risotto with cabbage, celery, green pepper, brown mushrooms, onions and garlic featured in last week's Wine Advisor FoodLetter. VALUE: This $13 tag is more than fair for a white of this quality; better still if you can find it in the $10 range. WHEN TO DRINK: GV can age surprisingly well, assuming excellent storage conditions, and this wine's sturdy metal screwcap is a plus for aging; but it's fresh and appealing right now, and not really made for the cellar. There's not much point in waiting.